The chilling incident of the premeditated massacre of 20 adivasis peasants of Sirkegudem, Kothagudem and Rajupenta in the Bijapur district of south Chhattisgarh on the night of 28 June 2012 have shocked the conscience of every democratic and freedom loving people of the subcontinent. Till date no action has been taken on the officers responsible for this cold-blooded murder. Worse was the nominal sorry rendered by P. Chidambaram in his dull academic tone followed by a regret by his CRPF chief that too when more and more glaring stories and reports started flooding the media from various independent observers and some of the conscientious journalists. We are witness to the countless massacres of dalits, adivasis, Muslims and other oppressed sections in the subcontinent by various gangs, landlord armies and private militias in the Indian subcontinent. But what we have witnessed in Bijapur is a continuing pattern of state-sponsored massacres committed by the so-called guardians of law with impunity. Significantly in this case, we come across a scenario in Post-1947 India where the Home Minister would openly defend the criminal act of the paramilitary without batting his eyelids. Rarely do we come across a situation where the Director General of the CRPF would openly come out in defence of the criminal act of his forces. Well this sum up the lawless face of the Indian state personified in the cold and calculated sophistry of a Chidambaram and his able accomplice in Vijay Kumar the CRPF chief. But the democratic and freedom loving people of the subcontinent have seen through the white lies propagated by Chidambaram, Raman Singh the Chhattisgarh Chief Minister and Vijay Kumar the CRPF chief as more and more tell-tale reports started pouring in from independent enquiry teams of civil rights bodies and other citizens who went to the area to get first hand information. 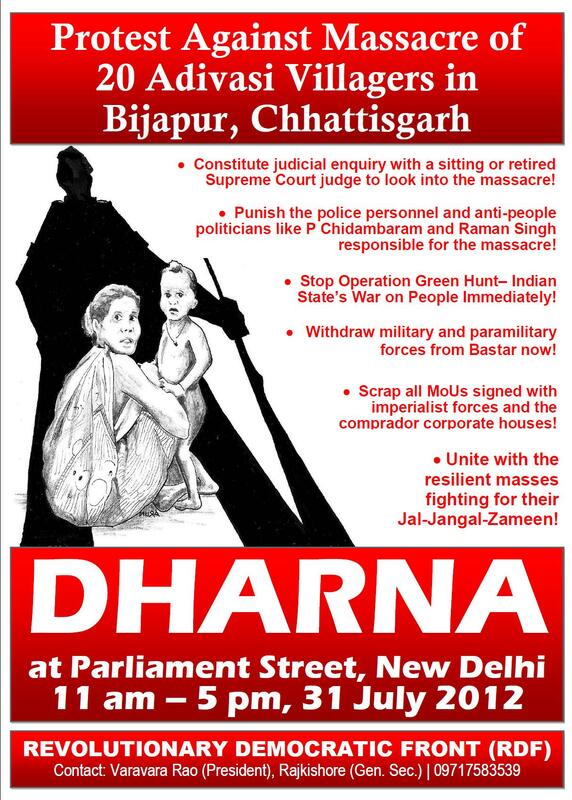 •	We invite you to be part of this protest demonstration to be held on the 31 July 2012 at Parliament Street from 11 am to 5 pm in which various people’s organisations, civil rights groups, intellectuals and prominent citizens from various states would participate. Your presence is very much needed at this juncture as an act of protest to strengthen the voice of the adivasis in Bastar. Unite with the resilient masses fighting for their Jal-Jangal-Zameen! •	Scrap all MoUs signed with imperialist MNCs and the domestic corporate houses.